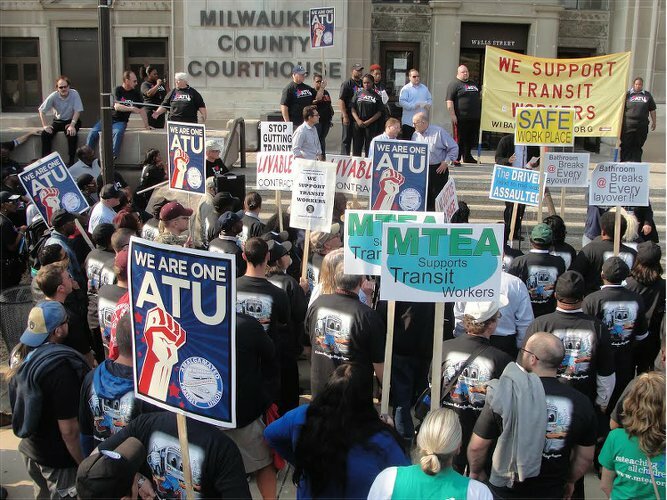 The Amalgamated Transit Union Local 998 will resume negotiations with the Milwaukee County Transit System Aug. 10 with the assistance of a federal mediator. ATU 998, which represents over 700 bus drivers and mechanics and is a majority African-American union with a progressive Civil Rights history, is fighting cut-back proposals from the county. These include attempts to decrease wages, increase part-time positions, gut the pension system and refuse to increase safety and bathroom breaks on bus layovers, which are now on average just four minutes. The union, with widespread labor-community support, waged a 72-hour work stoppage July 1-4 in opposition to these proposals. Other protests have taken place at locations such as Milwaukee County Executive Chris Abele’s posh apartment in downtown Milwaukee. ATU 998 President James Macon says another work stoppage is a possibility if the county continues with its austerity proposals. ATU leaders are asking supporters to call Abele and tell him to stop attacking the union with outrageous proposals that would drive down the standard of living even more for the bus drivers, mechanics and all workers in Milwaukee and statewide. Call Abele at 414-278-4211. For more information, go to the ATU-Local-998 Facebook page at tinyurl.com/pfxu3bd.